Laser-induced plasma; spectroscopy; plasma temperature; electron density. 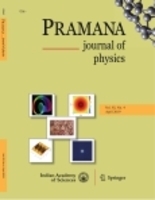 Plasma produced by a 355 nm pulsed Nd:YAG laser with a pulse duration of 6 ns focussed onto a copper solid sample in air at atmospheric pressure is studied spectroscopically. The temperature and electron density characterizing the plasma are measured by time-resolved spectroscopy of neutral atom and ion line emissions in the time window of 300–2000 ns. An echelle spectrograph coupled with a gated intensified charge coupled detector is used to record the plasma emissions. The temperature is obtained using the Boltzmann plot method and the electron density is determined using the Saha– Boltzmann equation method. Both parameters are studied as a function of delay time with respect to the onset of the laser pulse. The results are discussed. The time window where the plasma is optically thin and is also in local thermodynamic equilibrium (LTE), necessary for the laser-induced breakdown spectroscopy (LIBS) analysis of samples, is deduced from the temporal evolution of the intensity ratio of two Cu I lines. It is found to be 700–1000 ns.